Crawling babies are hard work especially at this time of year – they refuse to sit still and it’s too cold and wet to let them loose in the park like dogs. 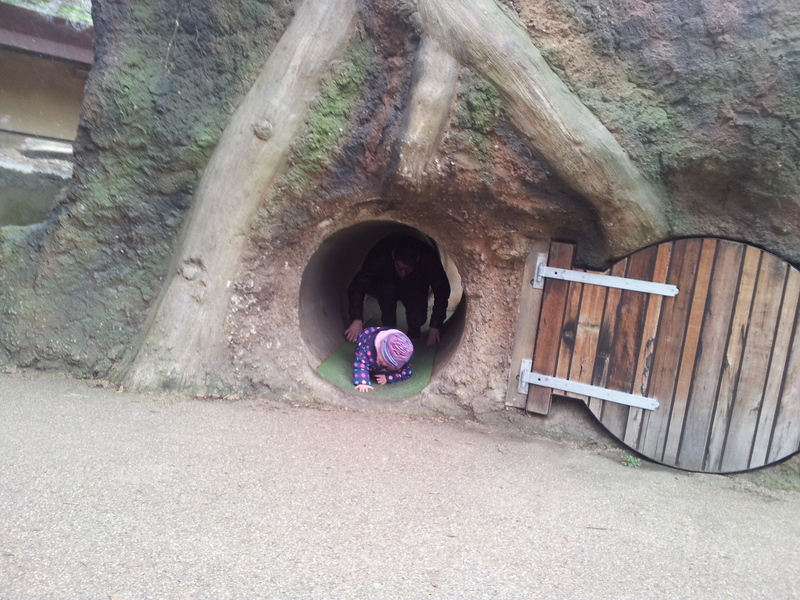 With the Easter holidays approaching and my garden full of snow I have put together a list of things to do in London with your little ones when they are crawling. It’s hard work getting out and about with a pram in London but there is a limit to the amount of times you can sing The Wheels On The Bus in a noisy church hall without losing the will to live. A trip into the real world is really good for making you feel like a person again and not just a mum. I approached catching the tube with a pram in the same way I approached childbirth -prepare for the worst, pack lots of food and when it gets too much scream for help. 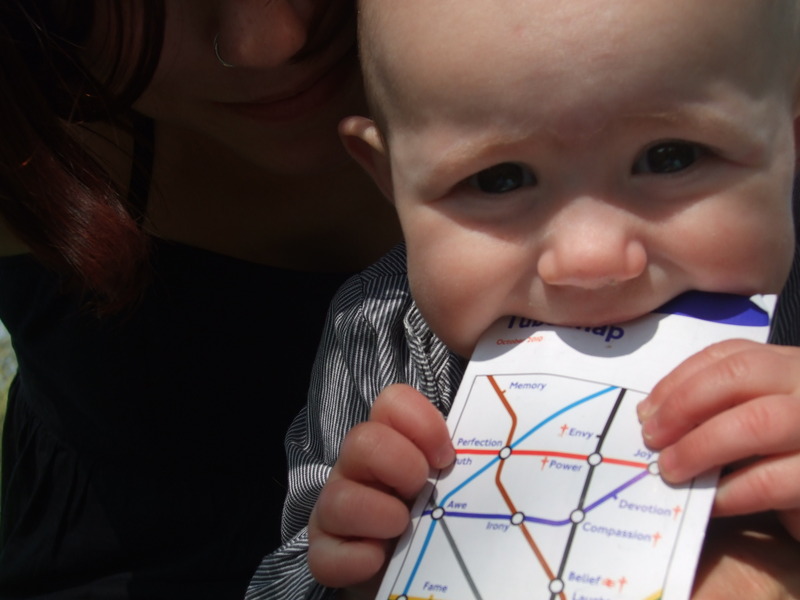 The more astute of you will realise that this is basically a list of places in London with clean floors but anyway here are my Top 10 suggestions for things to do in London with a crawling baby. 1. The South Bank/ Royal Festival Hall. Brilliant when it’s sunny. Less busy and just as much fun when it’s wet. The South Bank is my number one place to visit with kids of any age. 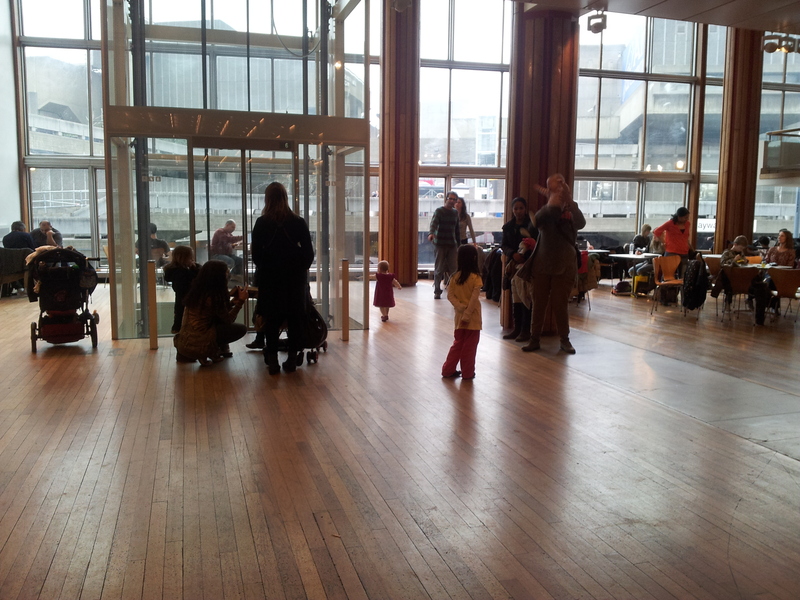 London Bridge has lifts for pushchairs from the trains to the street making it a great starter trip out. From Charing Cross you can walk across the Hungerford Bridge (try spot the skateboard graveyard over the side). Older children love watching the skateboarders by the Hayward Gallery. When it’s rainy and cold head to the Royal Festival Hall. There are usually events on here but even if not it is a fantastic wide, open, indoor space where you can sit down and let your offspring loose. Loads of toilets and baby changing facilities and there’s the singing lift to ride up and down in. 2. Tate Modern is even nearer to London Bridge again there’s lots of lovely floor to roll around on. There’s also a small area for under 3’s with a slide and stuff to climb on. Oh and art, lots of art. Don’t miss out on the cafe where you can take a picture of your little angels if you wave them about a bit under the lights. When you need to change a smelly nappy head for the baby room as the changing facilities in the toilets are on a shelf right by the door which means anyone coming in gets a face full of baby’s bum. And go push your pram over the Millennium Bridge it makes a really satisfying noise. 3. London Zoo. When the weather’s bad the zoo is less packed and there are still lots of indoor areas to explore. Don’t bother trying to see the whole place, just grab a coffee and install yourself in front of whatever animal takes your fancy. It’s the same as leaving the kids in front of Cbeebies but without all the middle class guilt. If the weather is good get in early and pack a towel there’s a brilliant water play area in the children’s zoo area. Probably best to avoid the city farms when your baby is crawling. My daughter hated being in the pushchair and wanted free reign to roll about on the floor. Even with my lax attitude to cleanliness I draw the line at watching a baby roll around in manure. 4. Don’t bother with the Natural History Museum. It’s always busy and a nightmare for pushing a pram around. It’s even worse during term time as there are always big school trips visiting. Save your energy and let school take them when they’re older. Also it’s soul destroying trying to interest a small child in the displays when all they really want to do is roll around on the floor……. 5. Go to The V & A instead. Seriously hear me out. What Eeh Bah Daughter really wanted to do at this age is sit on a metal grate and poke rice cakes through it. There are some beautiful cast iron Victorian floor grates in the V&A perfect for this. I’m surprised they don’t mention this in their promotional literature. 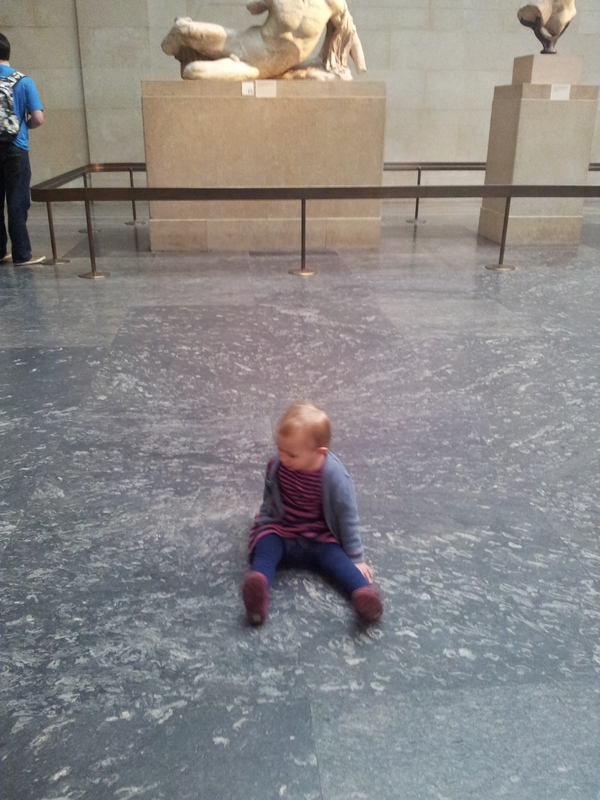 Just head to a quieter part of the museum and let your little one loose on the beautiful marble floor. Lets face it you’re going to spend a lot of time watching your child roll around on the floor, might as well do it somewhere gorgeous. And you can reward yourself with tea and cake in the Morris Room. If you do visit in the summer the garden cafe is a real winner – take a towel and you can strip baby off and let them splash about in the fountain. Last time we visited they still had the Heatherwick Studio wibbly wobbly spinny roundy chairs there. Total winner. 6. The British Museum. Forget the Elgin marbles we went dog, lion and lady spotting and had hours of fun. Lots of places to get lost in away from the crowds and some fantastic inspiration for future baby names. 7. The Museum of Childhood. Rather brilliantly the displays are in floor standing glass cabinets which means you’re not constantly lifting your child up to see stuff they have no interest in whatsoever. The changing exhibitions on the top floor usually have some interactive bits – we’ve played tea parties, dressed up and drawn pictures. There’s a Benugo cafe in the middle and as you’d expect it’s got good changing facilities. 8. The Wellcome Collection. This is a small museum with lots of interactive displays for little ones to smash up and dribble on. There’s a Peyton and Byrne cafe and a spectacular display of gory birthing tools you may want to avoid. It’s about a 15 min walk from the fantastic playground at Coram’s Fields and a short walk to Kings Cross which is fully pram accessible. Check out the street food market behind Kings Cross station where you can get great food without all the stress of a restaurant + baby. 9. Alexandra Palace. Maybe not worth the trip just to visit the palace BUT If there’s a Boat/ Wedding/ Tattoo show on that you want to go to with your baby you can do it (London Festival of Railway Modelling anyone?). If your baby is asleep. Head over to Little Dinosaurs soft play in The Grove, tire baby out, then slope off to the pub/ antiques fair. 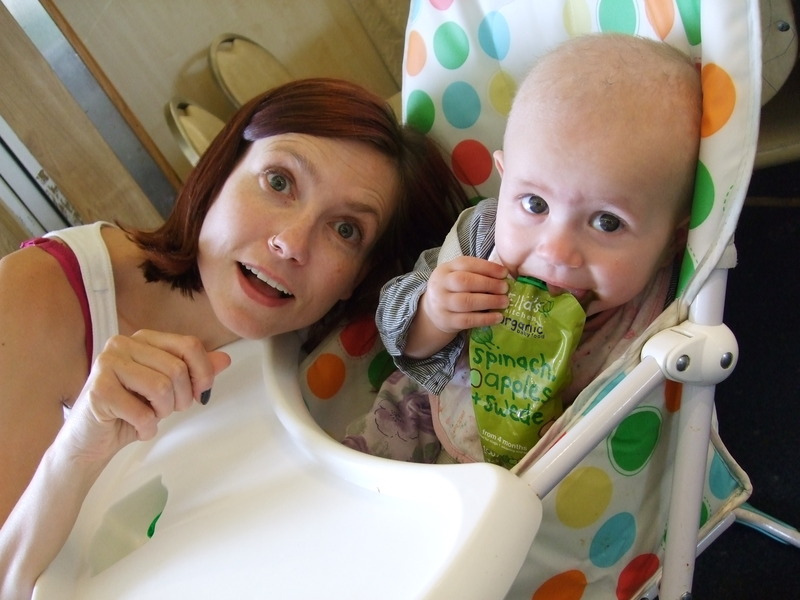 Nearby Crouch End and Muswell Hill are total baby full of baby friendly cafes. 10. Shopping. By the time my kids started to crawl I was desperate to get out of the shapeless maternity wear I’d been hiding in. But shopping with a baby is hard work. On a recent trip to L.A. I discovered a free soft play area in the Mall with a wine list. Unfortunately no such place exists in London (and could you imagine the queue?!). Obviously the best answer is childcare (the answer to most of my problems). I didn’t have any but here is my next best plan. Go with other mums or your partner, take some toys, install yourself on the top floor cafe at John Lewis then you can take it in turns to head out and weep in the many changing rooms of Oxford St. 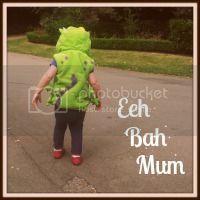 This entry was posted in children, family, funny, london, parenting and tagged alexandra palace, baby, british museum, children, day out, easter, family, John Lewis, list, london, royal festival hall, south bank, tate, top ten, travel, v&a, wellcome, zoo. Thanks – this has renewed my interest in getting out of the house with my two, rather than just staying in with just our lurgies, cbeebies and a few dried-up felt-tips for company. Lovely post. J a bit too old for me to worry about the cleanliness of the floor now (although I certainly had my moments). You are dead right about the V & A. We ended up there after a disastrous trip to the National History Museum. Sheer bliss and a lot more child friendly than I thought (possibly because it wasn’t full to the beams with other children dare I say it?). I was reallly pleasantly surprised that J enjoyed it as much as me! Thanks Emily. I’ll be posting about our trip across the US with a 2 year old and a 6 month old soon…. What a fab list – we really a kick up the bum to get us out of our little pocket of south London. Again, crying with laughter. This is exactly what I need: a list of all the clean floors. When my son was 10 months old we went camping. CAMPING! A crawling baby, who wakes up at the crack of dawn, in a muddy field, three hours before anything opens! It was a nightmare. Never again. Everything is so much easier when they’re on their feet. For shopping, I can recommend Croydon – there is a play cafe called Beanies near the high street with toys, dressing up, soft play, kids menu, coffees, cake etc. Go with friend. Park friend on play floor with kids and coffee. Go out shopping. Come back, swap, friend goes shopping. Done. I love you! I would love you a hell of a lot more if I’d read this six months ago though. My boy, at almost 18 months, took his first couple of steps today. I’m almost tempted to stall any further walking just so I can make the most of the above tips. I am a NYC based babysitter who will be traveling to London with a 10 month old next week. This list is amazing and yes, had me laughing out loud! I will definitely use this guide . If you end up in NYC the same is true with the Metropolitan Museum of Art and the Natural History Museum which are across Central Park from each other. The Met has very few other children, beautiful things to look at and, 4 mornings a week, story time!! Thanks for the info and the laugh! Thanks so much, will be trying out Little Dinosaurs with Harry tomorrow. I am braving visiting family in London at Easter with my 11mth old little floor crawler, this is now printed off to take with me! Thanks in advance for saving my sanity! Thanks for the ideas! We are travelling to London in September with an 18-month-0ld toddler. This is our first big trip with baby and I’ve been worrying about being with him in an unfamiliar city- wondering which places are realistic to visit with a baby in tow, which places are stroller accessible, have change tables, etc. This post is super helpful. Any more ideas for summer/early fall? Good one, thank u !